Who says needlepoint has to be worked on canvas? 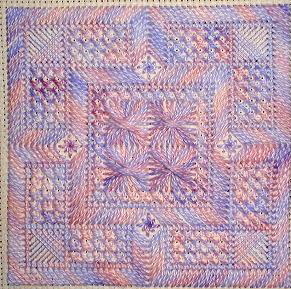 For this range of designs Aida (or evenweave) works really well and is perhaps more familiar to stitch on. It also fits into a hoop rather than having to be attached onto a rectangular frame for working. Its time to experiment! Let your inhibitions fly out of the window and have fun with colours, textures and types of fibre when working these pieces. Ideally suited are the “One Offs” from Oliver Twist which include many different types of thread which have all been dyed together to give a uniformity but also variation. Perle cottons also work well for these designs. Have fun (and don’t forget to show us your results)!